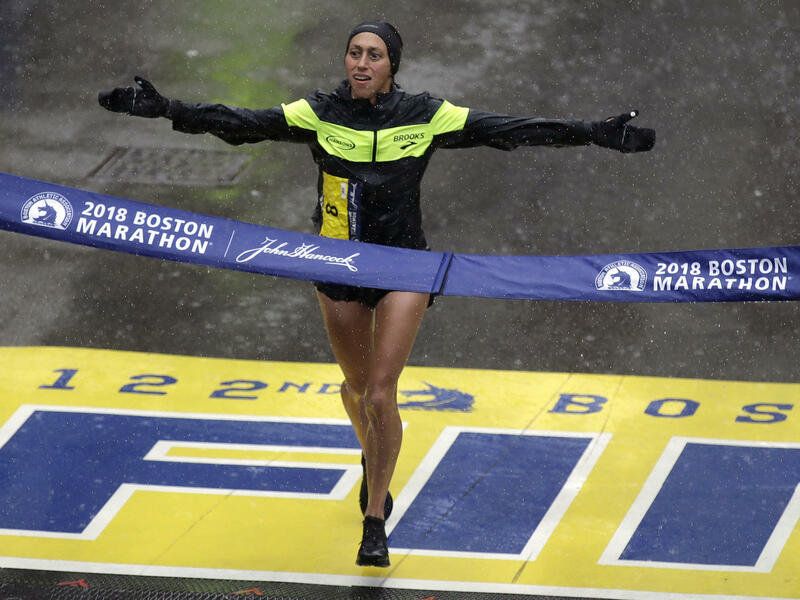 Desiree Linden wins the women's division of the Boston Marathon on Monday. She is the first American woman to win the race since 1985. It was a nasty day to run 26.2 miles through Boston. But American Desiree Linden pushed her way through a powerful headwind and cold rain and up Heartbreak Hill to triumph at the Boston Marathon — the first time a U.S. woman has won in 33 years. "It's supposed to be hard," Linden told reporters after her victory, shivering with a laurel wreath atop her head. "It's good to get it done." The poor conditions turned the race into a slog. Linden's winning time — 2 hours, 39 minutes and 54 seconds — is the slowest time for a winner in the women's race since 1978, according to The Associated Press. The winning time last year, posted by Kenya's Edna Kiplagat, was nearly 18 minutes faster. It was a big day for American women, who claimed seven of the top eight spots in the race. Linden, a 34-year-old who lives in Michigan, wowed commentators when she waited for Shalane Flanagan while her teammate made a quick toilet break 45 minutes into the race. In the 2011 Boston Marathon, Linden came in second, just two seconds behind winner Caroline Kilel. She ran it in a personal best 2:22:38. Linden is also a two-time Olympian — she came in seventh at the 2016 Rio Games but had to drop out a few miles into the marathon at the 2012 London Games because of a stress fracture. This year's men's race was won by Japan's Yuki Kawauchi, with a time of 2:15:58. He is Japan's first Boston Marathon winner since 1987. Boston was Kawauchi's fourth marathon — and fourth win — this year, The New York Times reports. "For me, these are the best conditions possible," he told the AP. Marcel Hug of Switzerland notched his fifth win in the men's wheelchair division, while American woman Tatyana McFadden also won her fifth title. This year's marathon marks five years since bombs exploded at the finish line, killing three people and wounding hundreds.